No holiday meal is complete without baked beans. When my Aunt Nancy recently sent me my Grandmother’s recipe, there was no better time to try my hand then Easter dinner. 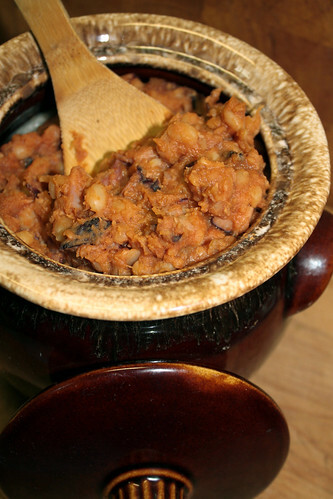 Luckily, I also had my Great-Grandmother’s bean pot to cook it in! Cover 1 lb of navy beans with water and soak overnight. The next day, rise beans. Place in a pot and cover with fresh water and 1/2 tsp baking soda. Boil beans until tender, but not falling apart*, about 30 min. Mix boiled beans with sugar, mustard, pepper and diced onions. Smoked or salt bacon works best. If you are using raw bacon, fry for a few minutes to remove some of fat. Add chopped bacon and pour tomato juice over beans. Mix. Place beans in a ceramic pot or a dutch oven and cover. Place in oven and bake for 3 hours at 325 degrees. *If you over cook beans (until they are mushy and falling apart), you can substitute tomato juice for 1 15 oz. can of tomato sauce and bake the same as above. 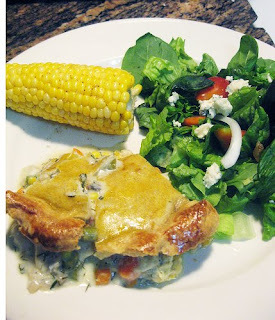 Its Thanksgiving time and we all want easy dishes with a bit of elegance. 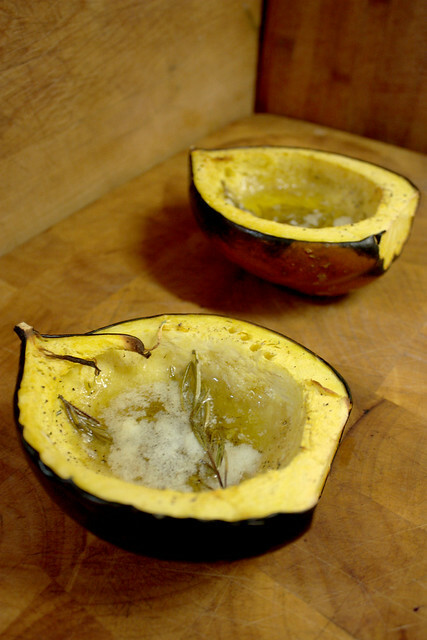 A tasty treat, easy as (frozen) pie and a natural fancy pants is serving up acorn squash in its shell. I love, love, love the sweetness of fresh squash in the autumn. Yes, it could take up some prime real estate in your oven on Turkey day if you’re serving a group, but if you’ve got the space, this is a gobble-gobble great way to go! Slice squash in half. Scoop out seeds. Pierce squash inside wells with a fork about 4-6 times, depending on size. Try not to pierce through the outer skin. Slice butter into squash halves, about 1 Tbs per half depending on taste preferences. Lay one stalk of rosemary in squash well, and sprinkle with a pinch of salt and pepper. 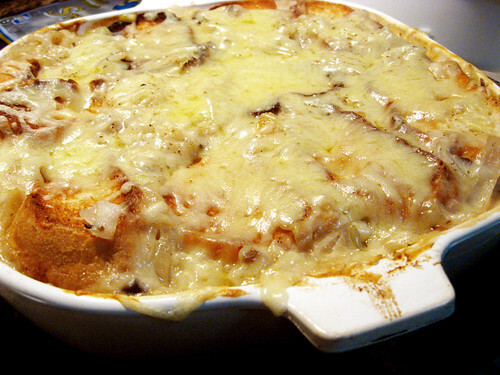 Place on a baking sheet into a preheated oven of about 350-400 degrees. 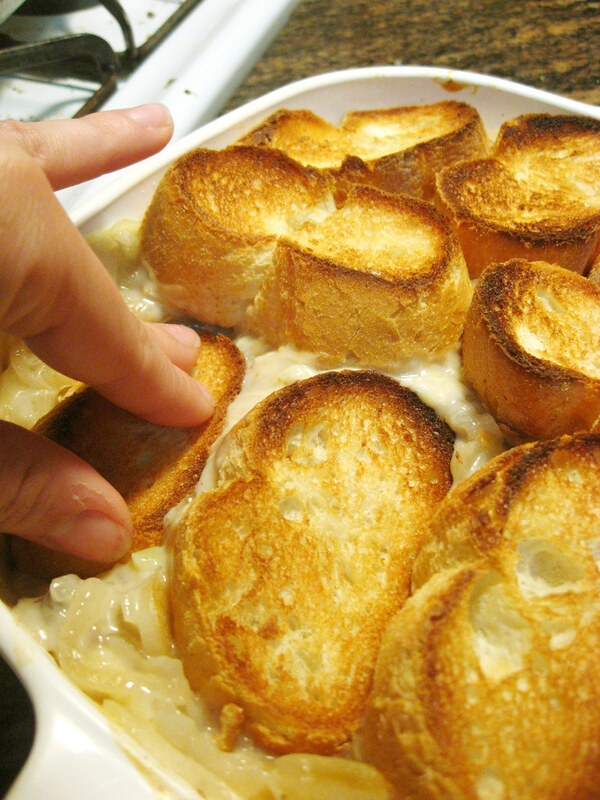 (You can roast these with other dishes in the oven if there’s space, so the temp variation is for that. Bake for about an hour, or until the squash tests soft with a fork, or as we like to say, forkable! 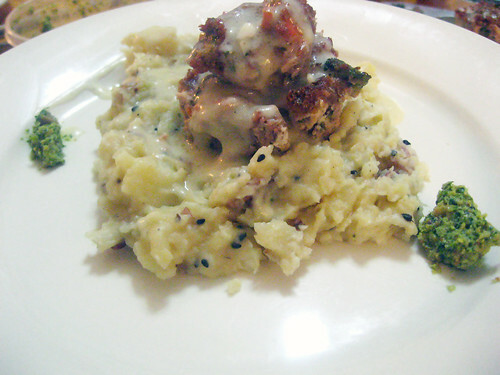 No ordinary mashed potatoes can ever be good enough for my Lamb Meatloaf. To spice up my all American mashed potatoes, I’ve added fennel bulb as well as toasted anise seed to lend a full bodied yet subtle licorice flavor. A bit of toasted black caraway adds a light lemon flavor to balance the slight sweet of the fennel and anise. 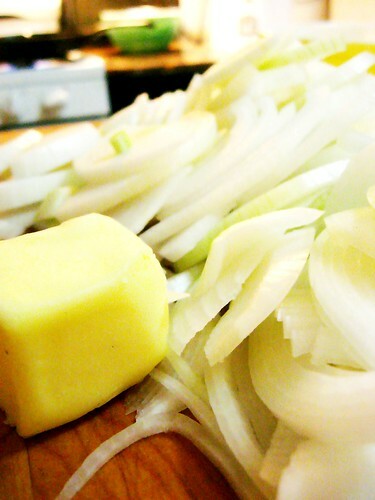 I love a creamy mashed potato best, so I braise the crunchy fennel bulbs and puree them before adding. 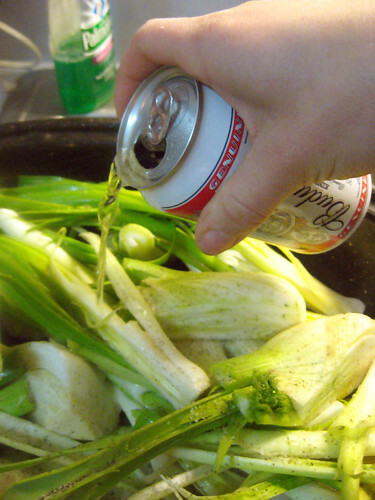 I don’t like things to go to waste and I do so love product placement, so I felt there was nothing better to braise the fennel in then the hidden Budweiser we found cleaning up from our Christmas party. This picture documents the way I spent my Saturday night before the Inauguration Bash. 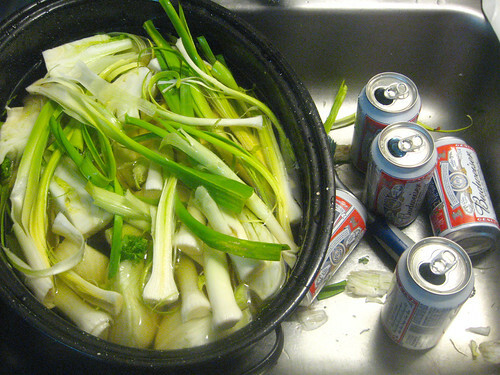 Looks like someone was having a drunk fest, unfortunately it was the leeks and fennel. I had some leeks from my parents garden laying around so I threw those in as well. 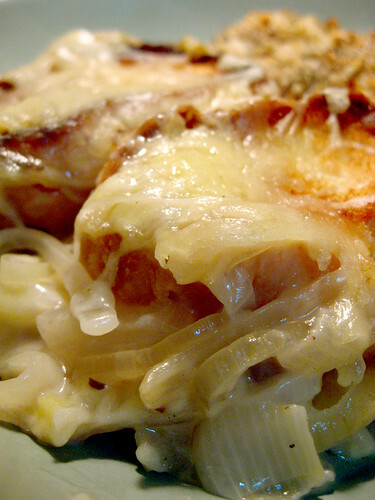 Prepare your leeks and fennel for the roaster. 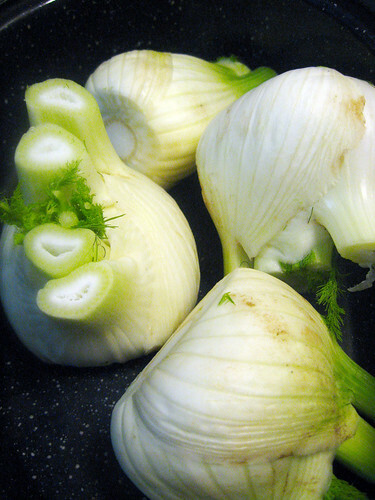 Cut the stalks off the fennel bulbs and remove the outer layer, which are usually too thick and woody to use . I find these cuttings are good in soup stock, so you may want to place in a plastic bag and throw in the freezer for the next time you make stock. Waste not, want not, blah blah. Ok, anway, cut your bulb in half or in quarters depending on its size and set in a roasting pan. On to the leeks. Leeks are hard to clean and even bulbs purchased from a store, will often have dirt in the layers, to make sure to do an additional rinse. I find its easiest to clean the leeks by cutting in half and running my fingers through the layers under the faucet. 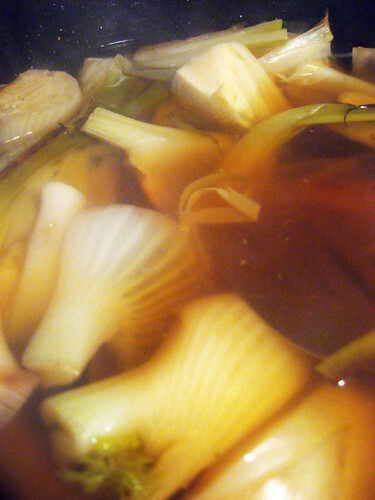 Place leeks in the roaster with the fennel and pour enough beer to cover the vegetables. Lager or another kind of light beer works great. I don’t suggest an ale or any hoppy beers because it will be too bitter. Braise your fennel and leeks in a preheated oven at 400 degrees until soft and easily pierced with a fork, usually about 60 – 90 minutes. Remove from oven. 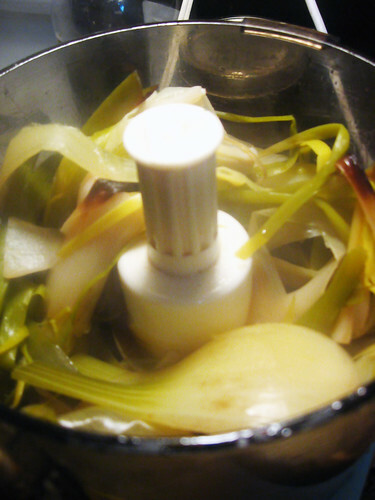 Drain liquid and place fennel and leeks into a food processor. Puree in food processor until smooth. Small chunks of vegetable are fine, but if there are bigger ones, you may want to remove them if they won’t process down. Once processed, set aside. Boil your potatoes. You can boil your potatoes whole or cut depending on your preference. I cut mine into quarters generally. 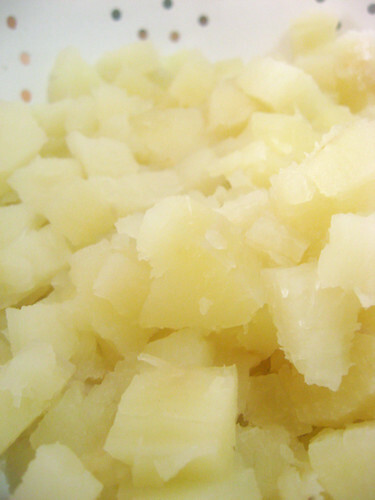 Place in a pot and fill with water until potatoes are covered. Place over medium high heat and bring water to a boil. After water is boiling bring heat down and allow to continue to boil until potatoes are soft and easily pierced with a fork. Make sure you stir your pot a few times while boiling so you don’t get any potatoes sticking to the bottom of the pot. While potatoes boil, toast your seeds. Heat oil in a skillet over medium high heat. Test the oil with a few anise seeds. 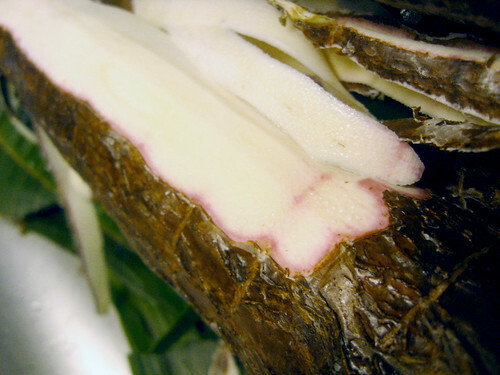 The seeds should sizzle in hot oil, but not darken immediately. If they darken immediately, turn heat down a bit and allow to sit for a couple of minutes. If the seeds don’t sizzle turn the heat up. When the oil is right, add all the seeds allowing them to toast until turned dark brown; remove pan from heat. The black caraway seeds won’t change color because they are already black so use the anise as a guide. Toasting seeds is one of the best parts of this dish because the air becomes so pungent with the aromatic smells. 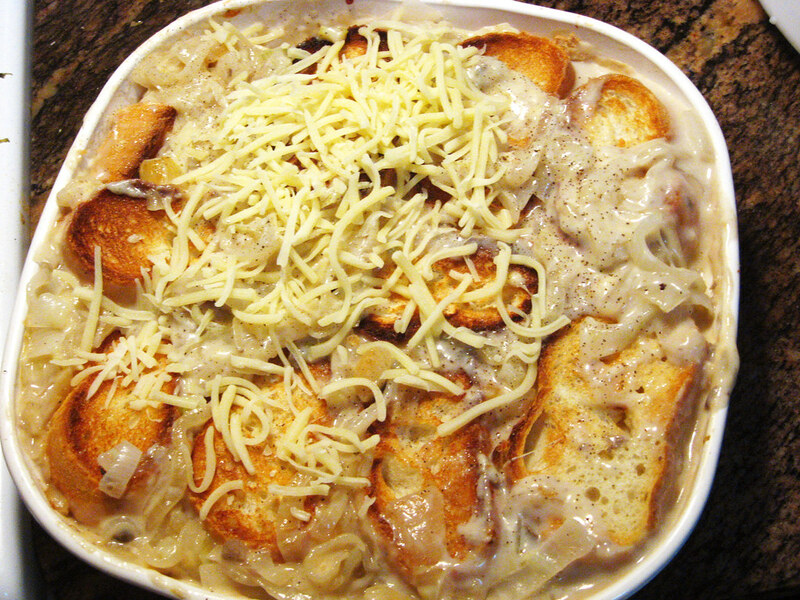 Assemble your potatoes. 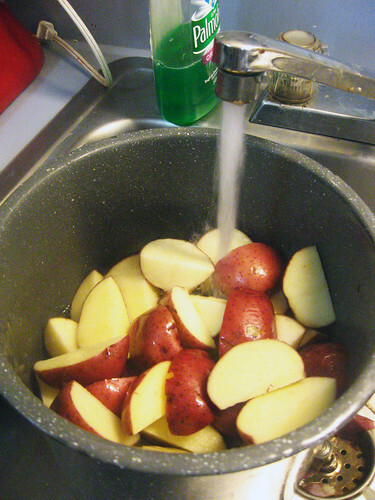 When the potatoes are cooked, drain water. 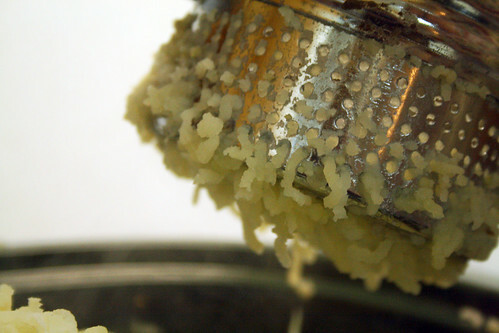 Using a hand mixer or a potato masher, mash potatoes roughly. Add toasted seeds in oil, butter, milk, Parmesan cheese and 1/4 c. of your fennel mixture. Mix using potato masher. Add salt and pepper to taste, start with 1/4 tsp of each and add more if necessary. Taste, and add more fennel mash, salt and/or milk and butter to taste. If you like your potatoes more creamy, add more milk and fennel, if you like it more salty add more salt and/or Parmesan cheese. I love these mashed potatoes! Salty and sweet, with complex full bodied flavor, I highly suggest them to pair with any meats cooked in a Middle Eastern or Indian manner. In this dish, home grown American tastes live in peace with the subtle exotic flavors of the East. Notes on spices: Black caraway and anise seed may not be regulars in your spice rack, particularly the black caraway. 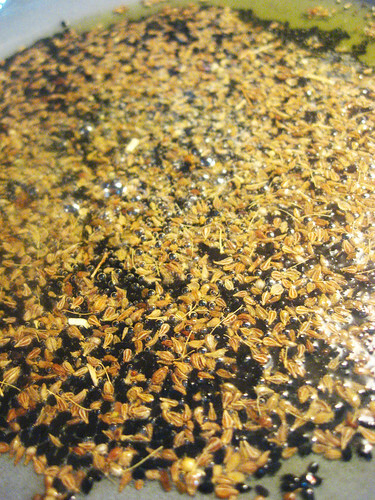 Anise seed should be available in most grocery stores. If you can’t find the anise seed, you can probably use fennel seed although this will not give exactly the same punch to the potatoes. As for the caraway, you can skip it entirely or if you still would like a bit of lemon flavor you could use perhaps 1/8 tsp of lemon zest. In the Midwest, nothing says summer more than sweet corn. 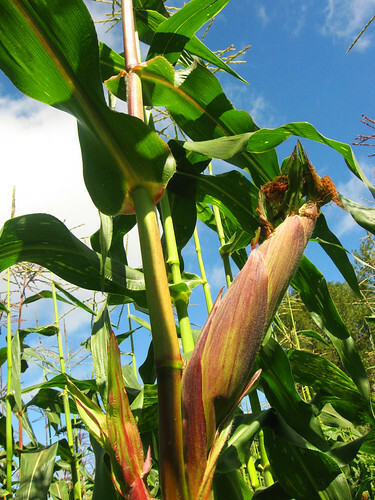 Whether you like it BBQ or boiled, corn is a staple for any harvest meal. I grew up, like most other Americans, slapping tons of butter all over my ear of corn and chomping away. A couple of years ago, my friend Meena, shared with me her Indian family’s method for seasoning corn which is delicious, easy and low fat. All you need is a few slices of lime, salt and garam masala. 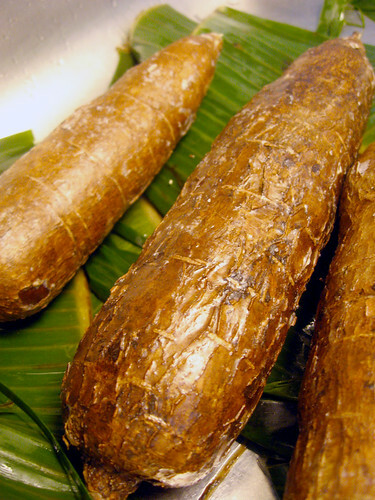 If you don’t have any Garam Masala, you can use curry powder or chili powder. On a small plate, pour out a small pile of salt on one half and the garam masala on the other half. 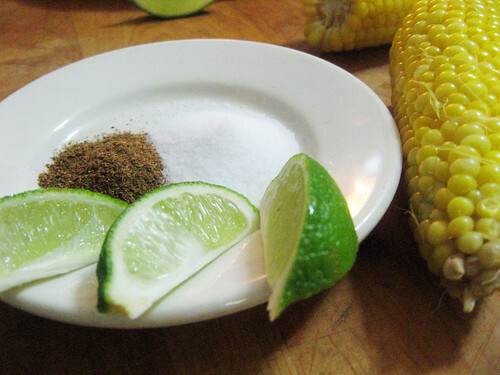 Take your lime slice and dip it in the seasonings until coated. 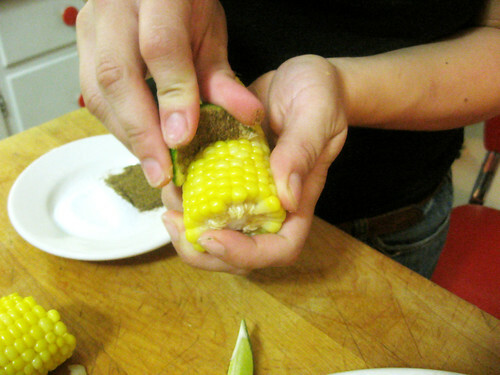 Take seasoned lime and spread over corn cob so the juices of the lime mix with the seasonings and are pressed into corn cob. The lime with the seasonings tastes similar to the salty butter yet also add a spicy tang which compliment the creamy sweet taste of the corn. That’s it, your corn is ready to be served with your dinner. Eat up and enjoy!